I received an email about the release of this report, PV Technology, Performance, and Cost – 2006, last week, although the report was first announced in a December 19, 2006, press release. Before searching, I had also not noticed this RenewableEnergyAccess.com IN FOCUS write up titled New Report Projects Future for the Global PV Market. 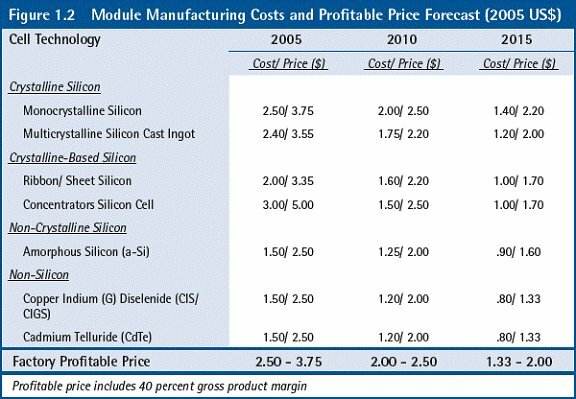 manufacturing costs and profitability for current and emerging technologies through 2015. At the price of $1200, the report’s appeal is limited to PV industry insiders, trade groups, investment analysts, governments, and think tanks. Be aware that only one half of the report price benefits the Prometheus Institute, a registered 501(c)3 non-profit organization. If you prefer to try before you buy, the Tables of Contents and Figures from the report can be perused here. Inside Greentech has an interview with Mr. Bradford (I assume all references to Beckford are in fact Bradford? ), Watch for falling solar margins, says report, by Dallas Kachan. In a prior Blog post, DEAL! 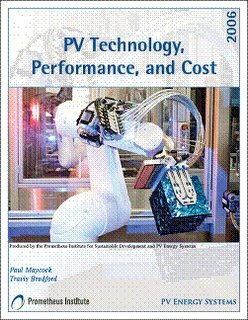 Solarvalue AG purchase receives final approval, I recommended reading the free report, Polysilicon: Supply, Demand & Implications for the PV Industry (free registration required for download), from The Prometheus Institute for Sustainable Development. I welcome a chance to write an independent review of the report, and I promise not to give the conclusions or ending away but provide a cost benefit assessment. I wonder if the Prometheus Institute folks will be interested in this proposal?